The Battery Doc is a smaller-sized charger. It works well…but so do many others. It’s a bit difficult to distinguish between the yellow and green light colors, but this doesn’t seem to affect the performance of the charger. We have three motorcycle battery chargers in the webBikeWorld garage that have been in constant use since about 2000, but I’ve just realized that in all this time we never ran a battery charger review article. They have become such an indispensable tool that we’ve probably taken them for granted and overlooked the possibility that webBikeWorld visitors may be interested in learning more. The three units are identical Battery Tender Plus chargers, and we haven’t experienced a single problem with them since they were first unpacked and turned on nearly 5 years ago. Every new motorcycle that comes into the garage gets a semi-permanent harness attached to its battery so it can be easily connected to a Battery Tender. Standard operating procedure is to connect the bike to the Battery Tender as soon as the bike is parked, and the bike is remains on the charger until it’s time for another ride. I also use one to keep my riding lawnmower battery charged and ready to go. Some motorcyclists will only use a battery charger occasionally in the winter, but most modern motorcycle battery chargers have a sophisticated electronic control system that allows them to be connected whenever the bike is parked. The systems will charge the battery when necessary and then they will continuously monitor the battery’s condition, activating the charging mode again if necessary. This is true for both the Battery Tender (made by Deltran Corporation) and for the Battery Doc (manufactured by Operating Tech Electronics, Inc.). Since most motorcycles are not ridden every day, and since motorcycle batteries, generally speaking, seem to be, shall we say, less robust than their automotive battery counterparts, it’s a good idea to keep the bike on a battery charger whenever it’s not being ridden, no matter what type of battery is installed. Traditional wet cell batteries require routine maintenance checks to ensure that the water level in each cell is correct. Many motorcycles are now provided with maintenance free batteries of various types, and both the Battery Tender and the Battery Doc will work with either type. 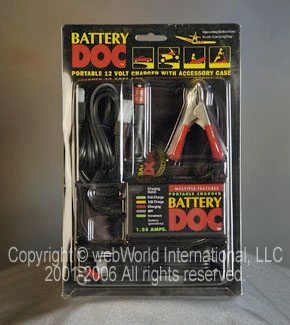 The Battery Doc: Charging unit (center); carrying case, instructions, battery harness (lower left), clips for temporary attachment to battery (bottom center), accessory plug (just under charging unit) and electrical cord at upper left. Whenever I buy a used motorcycle, one of the first things I do is to replace the lead/acid battery with a maintenance-free type. I’ve had great luck with WestCo maintenance-free motorcycle batteries (see the wBW article on installing a maintenance-free battery) and have used them with good results on several motorcycles. I have a sort of phobia about motorcycle battery problems, probably caused by let down by too many 6-Volt electrical systems many years ago. Another good reason to use a motorcycle battery charger is to increase the potential lifespan of the battery itself. Motorcycle batteries take lots of abuse, from heat and vibration to weak charging systems and too many power-draining accessories. The Battery Tender Plus has a useful blinking light that indicates what’s happening after the bike is connected. After a long ride, when I connect the Battery Tender, the red light usually comes on to tell me that it’s analyzing the state of the battery’s charge. The green light then usually starts blinking within seconds, indicating that the battery is being charged. A continuous green light means the battery is fully charged and ready to go. I’ve left a motorcycle on a Battery Tender with a solid green light for as much as 4 months without any problems. The Battery Tender monitors the state of charge and will keep the battery “topped up” when necessary, indicated by a blinking green light. For the sake of variety, we obtained a Battery Doc motorcycle battery charger to compare to the Battery Tender units. The Battery Doc is slightly smaller than the Battery Tender; the box that houses the electronics is only 4″ by 2-1/4″ by 1-1/4″ (about 100x60x30 mm), which is about the size of a small laptop computer power “brick”. 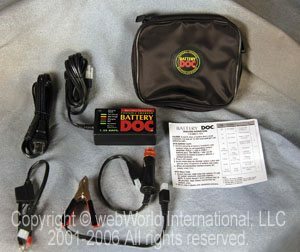 The Battery Doc comes with a fused connecting harness that can be semi-permanently mounted on the motorcycle’s battery and used to connect the Battery Doc without having to access the battery terminals. It also comes with an automotive type male accessory plug which can be connected to the Battery Doc and plugged in to the motorcycle’s accessory outlet, if available. The Battery Doc also comes with a zip-up carrying case, which can be used to store the assorted parts when necessary. Red, yellow and green flashing lights are used as indicators on the Battery Doc; however, it’s not easy to tell the difference between colors. The Battery Doc is a 1.25 amp charger. When it’s first connected to the motorcycle’s battery, the LED light will show red, meaning that the battery is charging. Depending upon the battery’s charge, the light will then turn yellow at 1/2 charge and green at full charge. We find it very hard to differentiate between the yellow and green lights, but that doesn’t seem to be a big problem. There is also a flashing green light for “Incorrect”. I’m not sure what “Incorrect” means, and the instructions that came with the Battery Doc don’t describe this condition. The Battery Tender’s red light will flash if the unit is not connected properly, and you would think a red flashing light is almost a universal symbol for “problem”, but I’m not sure why the Battery Doc doesn’t use this signal. In any case, I’m also of mixed feelings regarding the usefulness of the Battery Doc’s indicator lights. They’re ok, but no better or worse than the indicators on the Battery Tender Plus. We tried a very unscientific experiment after noticing that the Battery Doc seemed to take longer to bring the batteries up to full charge than the Battery Tender. Starting with a fully charged battery, we took the webBikeWorld 1998 Triumph Tiger test mule out for a 25 mile ride, then left it sitting for one week without a battery charger. We connected the Battery Tender Plus, which started blinking green within 3 minutes, indicating that a charge was in process. After about 12 minutes, the Battery Tender Plus indicated a full charge. We then took the bike out on another 25 mile ride, came in and parked it in the same garage for one week. We then connected the Battery Doc, and it’s indicator light showed red, indicating that it was charging. 40 minutes later, the yellow light indicated that the battery was at 1/2 charge, and about 20 minutes after that, the light turned green (we think), indicating a full charge. Either the difference between the yellow (half-charge) and green (full charge) lights is so minute on our Battery Doc, or the lights aren’t working correctly, but it’s very hard to notice the difference in color. We just figure that if it looks yellow/green and the charger has been connected for a while, then the light must be indicating that the battery is charged. The Battery Doc uses nice nylon electrical connectors that snap together to hold the wire terminals. I like the design, because the terminals are covered by the nylon and the connection is somewhat protected from dust and moisture when snapped together. The Battery Tender uses a male/female connector, and although we’ve never experienced any problems with this type, I’m not fond of the exposed male terminal. On the plus side, the Battery Tender accessories and cables that use the standard Battery Tender connector are available at almost any motorcycle shop. We purchased a 25-foot Battery Tender extension cable that comes in very handy when we need to connect the charger to various bikes parked in the garage. 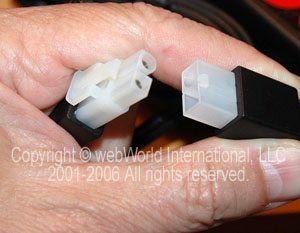 The Battery Tender’s BMW motorcycle accessory connector (the smaller European style accessory plug), is optional, the Battery Doc has a special insert that allows its accessory plug to be used on both U.S. and European style outlets. The bottom line is that in our experience, both of these products are useful tools that will help keep your motorcycle’s battery in good shape by maintaining the proper charge whenever the bike is not in use. We can’t prove the claims that using a battery charger will increase the life of a motorcycle battery by three or four times, but (knock wood) we have not had any problems with any motorcycle batteries on webBikeWorld motorcycles since we started the routine use of the Battery Tender or Battery Doc almost 5 years ago. Motorcycle batteries are relatively more expensive than automotive batteries, so spending the $40.00 or so on an intelligent trickle charger may be a good investment. Using one can also help eliminate any stress or worries about battery problems, especially if the bike is parked during the long winter months.